The product, developed by Hort Innovation and CSIRO, Australia's national science agency, packs a healthy punch with approximately one serve of broccoli in every two tablespoons of powder. "With a rising trend in healthy eating across the board, Australian growers are always looking at ways to diversify their products and cut waste while meeting consumer demand," Mr Lloyd said. He also said despite the increasing popularity of 'superfoods' and health and wellness, Australian diets are still poor. "Research shows the average Australian is still not eating the recommended daily intake of vegetables a day, and options such as broccoli powder will help address this," he said. The 100 per cent broccoli powder is made from whole broccoli, and produced using a combination of selected pre-treatment and drying processes to retain the natural colour, flavour and nutrient composition of fresh broccoli. Lead researcher, CSIRO's Mary Ann Augustin, said the broccoli was high in protein and fibre, and health-promoting bioactive phytochemicals, making it an ideal candidate for powder development. "The powders are an option for farmers who want to produce value-added vegetable ingredients for the lucrative functional food markets," Dr Augustin said. "The broccoli powder has already been used for the production of extruded snacks with high vegetable content. "Prototype extruded snacks with 20-100 per cent vegetable content were displayed during National Science Week at the Queen Victoria Market last year and were well-received by parents and even by kids." "The CSIRO team and Hort Innovation are discussing potential commercial applications with produce growers and grower groups across Australia who are interested in getting the powder on the market," she said. "I see this project as the emerging new food trend," Mr Said said. "Australians don't eat enough vegetables and farmers across Australia will have access to an alternative market whilst improving farm yields and sustainability. "They will also be contributing to healthier lifestyles!" 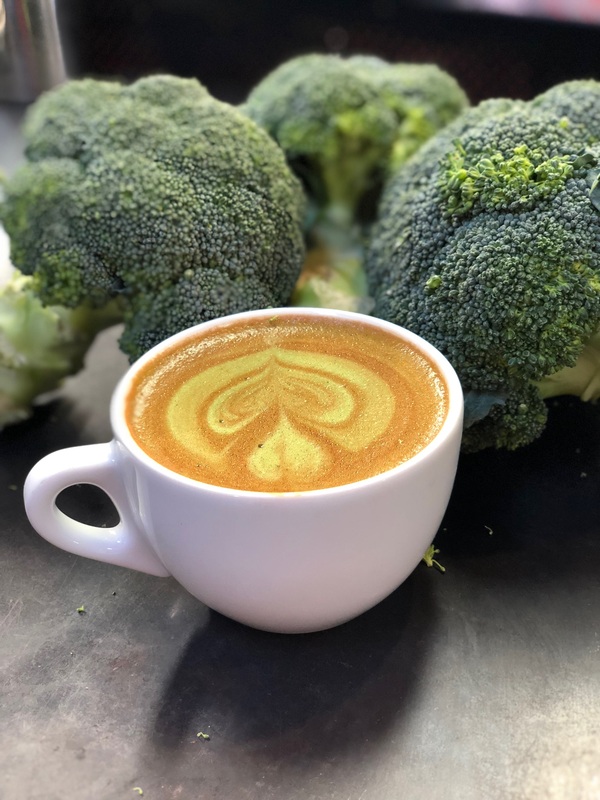 A broccoli latte brewed at Common Folk café.